The Hell Gap site was first uncovered in the late 1950s and is one of the gems in the history of American archaeology. Yet it is still one of the least understood and most poorly published of the sites that helped establish the framework for Paleoindian archaeology as it exists today. No other excavated site in North America contains a record that includes all cultural complexes known on the Plains between 11,000 and 8,000 B.P. Major excavations during the 1960s, conducted by the University of Wyoming and Harvard’s Peabody Museum, not only removed vast quantities of Paleoindian deposits, but also trained some of the foremost archaeologists of our time. 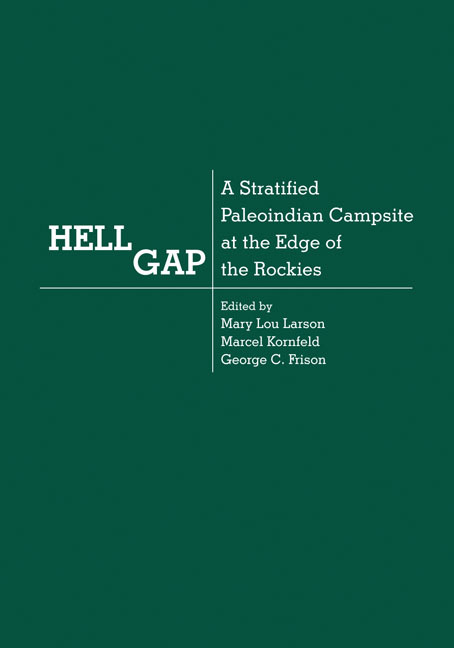 Much has happened in American archaeology in the intervening years and modern techniques of dating, excavation, and analysis are now capable of revealing much more about the specifics of Hell Gap. This volume finally begins the analysis of the vast quantity of material recovered from one of the most significant Paleoindian sites in North America, as contributors consider such topics as settlement, subsistence, technology, paleoenvironments, and archaeological site formation. The studies included here expand our understanding of the results of the original investigators, while providing an important reevaluation of their interpretations. Mary Lou Larson is a professor of anthropology and associate director of the George C. Frison Institute of Archaeology and Anthropology at the University of Wyoming. She has coedited Aggregate Analysis in Chipped Stone (University of Utah Press, 2004) and Changing Perspectives on the Archaic in the Rocky Mountains and Northwestern Plains. Marcel Kornfeld is a professor of anthropology and director of the George C. Frison Institute of Archaeology and Anthropology at the University of Wyoming. He is the author of seven monographs, most recently On Shelter’s Ledge: Histories, Theories and Methods of Rockshelter Research, and coeditor of Islands on the Plains: Ecological, Social, and Ritual Use of Landscapes (University of Utah Press, 2003). George C. Frison is professor emeritus of anthropology at the University of Wyoming and past-president of the Society for American Archaeology. He has published many books including Survival by Hunting and Prehistoric Hunters of the High Plains.